San Antonio's Shelly Works advanced to the third round in the Women's 45s. 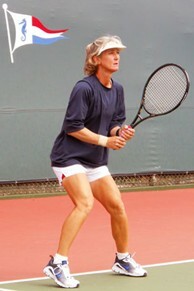 LA JOLLA, Calif. – After receiving a first-round bye, unseeded Shelly Works of San Antonio, Texas eliminated Russia’s Elena Barabash, 6-2, 6-0, to move into the third round of the Women’s 45 division at the 2012 International Tennis Federation Seniors World Individual Championships. Works, who captured the United States Tennis Association National Hard Court and Indoor singles titles in the Women’s 45s last year, used the first few games of the match to figure out a strategy against her hard-hitting opponent. On a breezy, mostly cloudy day at the La Jolla Beach & Tennis Club, Works mixed up the pace of her shots against Barabash and began to draw errors from the Russian who could not match her consistent game from the baseline. Even though Works describes herself as a baseliner, she showed during the match that she is not hesitant to be more aggressive and come to the net and put a ball away. As Works controlled the tempo of the match, she won the first set and dominated the second set as she quickly built a 5-0 lead. Barabash served to stay in the match, but on match point against her, Works slammed a backhand cross court winner to seal the victory. In the week prior to the ITF Seniors World Individual Championships, Works represented the U.S. in the Margaret Court Cup in the ITF Seniors World Team Championships in San Diego. The U.S. dropped a narrow 2-1 decision to Ireland, the eventual winner, and finished in 5th place. It was the first time Works had played in the international team competition after having to decline two previous invitations due to family commitments. "It was good to play the team competition first because you don’t have so many nerves going into the first round of this (individual event). It’s a little more comfortable," Works said. Works credits her fitness for her on-court success. "Fitness is a big deal for me. I work out a lot," Works said. "I do a lot of training, speed and agility work and weights." She says her fitness allows her to stay on the court and wear down her opponents in long matches. "I basically just run down every ball that I can and try and outlast my opponents. In singles, I tend to lay back on the baseline and hit 50 million balls until somebody hits one out," Works said. Just how fit is the 48-year-old Works? In 2011, she lost in the singles final of the USTA National 45Clay Court Championships in a five-hour match. However, that was not the longest match she’s ever played. In 2002, Works played for six and a half hours in the 3rd/4th place match at the USTA National 35 Clay Court Championships. Works advances to the third round, where she could possibly meet top-seeded Klaartje Van Baarle of Belgium, who was scheduled to play Mexico’s Veronica Villar in the second round. In other tournament action, Bill Kellogg of the United States defeated qualifier and fellow American Shawn Schraeger, 6-4, 4-6, 6-4, at the La Jolla Beach & Tennis Club to reach the second round of the Men’s 55 division.